Whether you need to ensure quality, source new raw materials or ensure the purity and stability of your existing ones, determine residual solvents in your products or confirm the stability of them, we are here to help. We can also work with you to develop new test methods. At Lucideon, we provide more than just numbers - we offer solutions to help you develop new products, optimize existing ones and solve failures quickly. We are fully GMP certified for quality control testing of human and veterinary medicinal products (full documentation is available to download on the right of this page). All Lucideon’s services are undertaken in compliance with EU guidance on GMP as it applies to contract QC testing laboratories. We are MHRA-inspected (successfully re-accredited in September 2016), and a UKAS accredited testing house (No. 0013), so you can trust that the test data that we provide to you is accurate and reliable. Our highly qualified and experienced technical staff use transparent, traceable, calibrated techniques and state-of-the-art equipment. Extractables and Leachables (E&L) testing is used to identify such compounds and elements by following ISO 10993 and employing a range of analytical techniques. Our expert analysts here at Lucideon can work with you to perform E&L testing and subsequently help to minimise associated risks with your products. Using a wide range of chemical analysis techniques, we provide QC testing of raw materials, APIs, finished products, packaging materials and medical devices as outlined in marketing authorizations and pharmacopoeias. At Lucideon our experts can identify, assay and determine the quality, purity and stability of your raw materials to be used in manufacture. Analysis can be carried out in accordance with pharmacopoeial monographs (Ph. Eur., BP, USP and JP) and/or to your specifications. We analyse residual solvents in drug substances, excipients and products as detailed in the USP-NF Chapter <467>. We can develop and validate methods tailored to your specification if required. Residual solvent testing on pharmaceutical products is required to ensure minimal risk levels, such that they do not impact on patient safety. 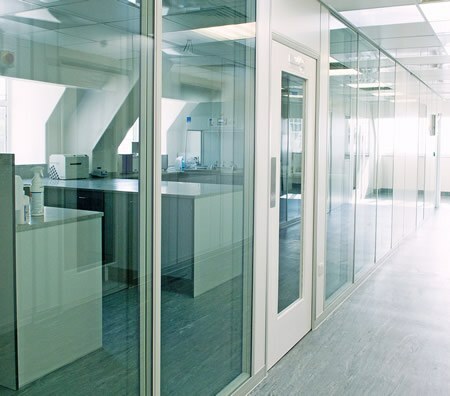 Our storage stability walk-in chambers, controlled to ICH guidelines, are monitored 24/7/365 and have built-in safeguards to give you peace of mind. Additional stand-alone cabinets enable us to offer alternative parameters including refrigerated, frozen and client defined storage conditions. Our experienced staff can aid with study design, planning and management of stability storage testing. Whether it's analysing water quality to pharmacopoeial monographs (Ph. Eur., USP, BP, JP), HTM directives, Microbiology of Drinking Water or Total Organic Carbon (TOC) - at Lucideon we can help. Medical devices need to be cleaned thoroughly and effectively to ensure their safety in use. Reusable devices (such as surgical tools etc.) require reprocessing (cleaning and disinfection/sterilization) between each use. To ensure the effectiveness of such reprocessing methods, manufacturers are required to validate their cleaning and disinfection/sterilization processes as part of the device instructions for use (IFU).